While Iran produces about 90 percent of the world’s saffron, small German companies are growing by importing Iran’s saffron and exporting it as luxury goods to Persian Gulf littoral states. Once cultivated by Persian kings and believed to have healing powers, saffron is now fuelling the growth of a small German business that imports tons of the spice from Iran to make fine food products for sale in Europe and the Persian Gulf. “We try to capture the soul of saffron and the magic it contains,” says Michael Sabet, an Iranian-German business executive who quit his banking job six years ago to found Miasa GmbH, which is now doubling its revenues every year. Sabet is one of many German business leaders who see great business opportunities opening up in Iran after the end of sanctions. German Economy Minister Sigmar Gabriel heads to Iran next week with a plane full of executives keen to rebuild trade ties. Miasa delivers large quantities of high quality saffron to industrial users, but also produces 20 different products ranging from saffron-infused sea salt, honey, rice and even coffee that are sold via the company’s website or at luxury stores in Berlin. It also produces a liquor infused with elderberry, lychees and saffron that sells for nearly 40 euros ($44.90) a bottle, and even comes in a non-alcoholic version for sale to Muslim countries, as reported by Reuters and covered by Fars. Sabet says the business is growing fast given increasing demand for specialty “fine foods,” the rise of gourmet cooking shows and the increasing popularity of Middle Eastern cooking. Sweden is one of the biggest consumers of saffron because the spice plays a key role in Christmas baked goods, he said. In the Persian Gulf, more consumers are also looking for packaged products such saffron rice, he said. Initially Sabet tried to grow saffron – which comes from the flower of the crocus plant – in Germany’s Black Forest, but soon realised the yield per plant was far too low to produce the quantities needed for industrial-scale sales. 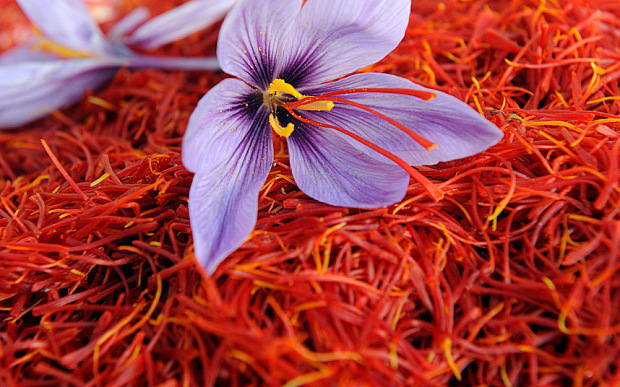 Iran produces about 90 percent of the world’s saffron. The idea for Miasa was born when Sabet’s Iranian father and German mother brought back a can of saffron from a trip to Iran. “This has opened up whole new horizons for me. I’m getting back into the language and learning so much,” he said.